Nike's Air Max 270 Bowfin Flexes in "Black/Phantom Desert"
Following previews of several upcoming colorways, Nike‘s Air Max 270 Bowfin surfaces in a clean “Black/Phantom Desert” edition with a full set of official imagery. In line with the recent comebacks such as the Air Terra Humara ‘18, Nike’s new Bowfin taps into the retro trail sneaker trend with a mixed textile upper, pullcord lacing system and prominent criss-cross panel overlays. This colorway sees a beige nylon upper, patterned accents, contrast black trims and leather mudguard, a black Air Max 270 heel and orange Nike branded tabs. 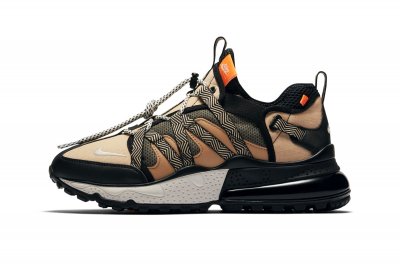 The Nike Air Max 270 Bowfin “Black/Phantom Desert” is slated to launch sometime in October for $150 USD. Stay tuned for the exact release date and let us know if this is a cop in the comments below. In the meantime, you can pick up the Nike ACG Ruckel Ridge in “Black/Geode Teal” now. An up-close look at Pebble Beach. Nike ACG Ruckel Ridge Looks Stealthy in "Black/Geode Teal"
Snag a piece while supplies last. The pork producer calls out the streetwear mainstay on Twitter.